This article is a teaching from the Ascended Masters, with contributions from Waireti, who has dimensional sight. We all have an Earth Star. 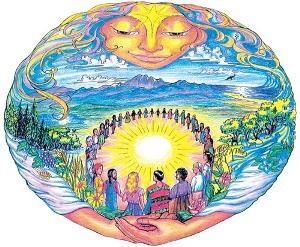 It is the connection of conscious life to the Mother Earth. The Earth Star is our anchor, it keeps us in body. The Earth Star is our link to the Mother Earth and to this dimension. When a baby takes its first breath, the Earth Star arrives, holding the conscious life force to the Earth. When we die, the Earth Star goes into stasis. It does not cease to be, rather it waits for our return to body once more on the cycle of rebirth. We have one Earth Star through all of our lives. Papatuanuku, the Mother Earth, knows each and every one of us. She knows of our first moment of conscious life when she created an Earth Star just for each one of us, she follows our many lives and ascension. She knows us, we are of her. We are her children. We are in her heart. The Earth Star is commonly called a chakra. I would call it the Master chakra. For in our death all is downloaded from our chakras into it, and when we are reborn and reconnect to the Earth Star it uploads to the chakras all the dross, all the karma, all the past life baggage we still carry with us. In our death, Papatuanuku holds the Earth star, this precious aspect of our being within her, in safe keeping, till we are called once more into body, by the magnetic force of our Earth Star and the karma it holds. The Earth Star is usually 6 inches below our feet in the body of our Mother Earth (Papatuanuku), it can be deeper, but Waireti sees it most at 6 inches. In fact in healings with the Masters, if it is lower they work to bring it to the 6 inch position. Waireti, sees all Earth Stars and knows they are every colour, sometimes reflecting the soul ray colour, sometimes not, some Earth Stars have 2 colours, some change colours, some don't. Most are shaped like a triangle, well actually little pyramids, with the apex down; others are orbs, cones and cuboids. Some are not in great shape, with cracks or even hollow, but the Ascended Master healing, here at the Ascended Master portal usually rectifies this. As we ascend into higher vibrations, and start the conscious journey towards leaving the cycle of rebirth, our earth star will start to change it's colour to silver. Silver indicates the person is moving into a new phase with their relationship with the Mother and has the potential to leave the cycle of rebirth. Papatuanuku has appeared several times in body at the Ascended Masters portal. For this teaching she drew me down into the Earth with her. And she indicated I look up and there above, like looking at a ceiling were countless shapes, like stars in the sky, these were the Earth Stars of humanity. Some were bright colours and solid, some were coloured like a bubble, transparent but with form, these were the ones of those not in body. For she showed me, when a person dies their Earth Star sinks further down into the Mother, waiting for rebirth and the Earth Stars rising once more. Many of you have a calling for home, believing you originate from another planet, looking often to the stars. When a person from another planet visits our own Papatuanuku, their Earth Star is welcomed, like a sister’s child. And if they die here, their Earth Star stays here within our Earth, holding them to this planets cycles of rebirth, holding their Earth Star till such time as they Ascend and can return home. When each person on the Earth comes to that time in their spiritual evolution that they ascend beyond the cycle of rebirth, then Papatuanuku is the one to step forward to release us from our Earth Star. At our ascension it is her that cuts the cord of our Earth Star handing us to the Father, who then rebuilds another Star beneath our feet, the Star of the Father not of the Mother, so that at our final death, we are drawn to the Father not to the Mother. For an Ascended Master to return to the earth, they come on the celestial star of the Father, anchoring them here for their life span. Your current Earth Star colour and shape is included in the Ascension reading.